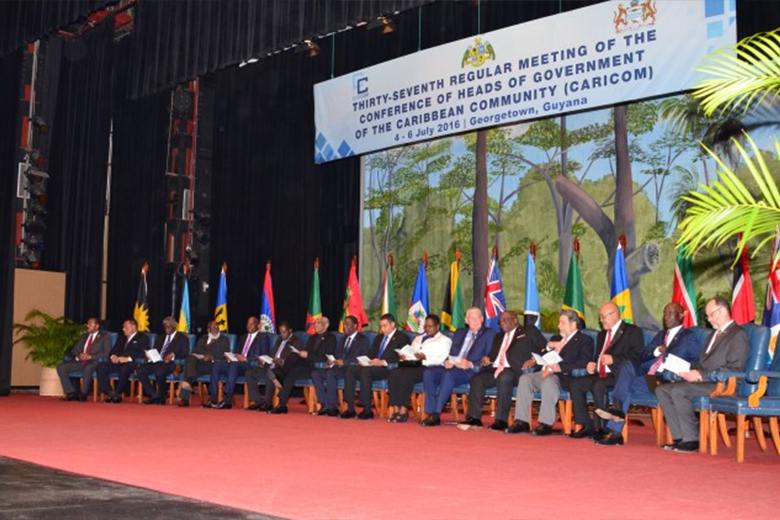 Communiqué issued at the conclusion of The Thirty-Seventh Regular Meeting of the CARICOM Heads of Government, 4-6 July 2016, Georgetown Guyana. The Thirty-Seventh Regular Meeting of the Conference of Heads of Government of the Caribbean Community (CARICOM) was held at Georgetown, Guyana, on 4 – 6 July 2016. The Prime Minister of Dominica, the Honourable Roosevelt Skerrit, chaired the proceedings. Other members of the Conference in attendance were Prime Minister of Antigua and Barbuda, Honourable Gaston Browne; Prime Minister of The Bahamas, Rt. Honourable Perry Christie; Prime Minister of Barbados, Rt. Honourable Freundel Stuart; Prime Minister of Grenada, Dr. the Rt. Honourable Keith Mitchell; President of Guyana, His Excellency Brigadier (Ret) David Granger; Prime Minister of Jamaica, Most Honourable Andrew Holness; Prime Minister of St. Kitts and Nevis, Dr. the Honourable Timothy Harris; Prime Minister of Saint Lucia, Honourable Allen Chastanet; Prime Minister of St. Vincent and the Grenadines, Dr. the Honourable buy tramadol overnight Ralph Gonsalves; President of Suriname, His Excellency Desiré Bouterse; and Prime Minister of Trinidad and Tobago, Dr. the Honourable Keith Rowley. As the Tenth Anniversary of the historic Port of Spain Declaration “Uniting to fight the Non-Communicable Diseases (NCDs)” draws near, the Heads of Government recognised the progress made in addressing the issue. They acknowledged, however, that progress was variable and agreed to adopt a more holistic approach. In this regard, they pledged to address issues such as the banning of smoking in public places; trade related measures; banning advertisement of potentially harmful foods which specifically target children; and elevating taxes on foods high in sugar, salt and trans-fats. Read the full Communiqué here.